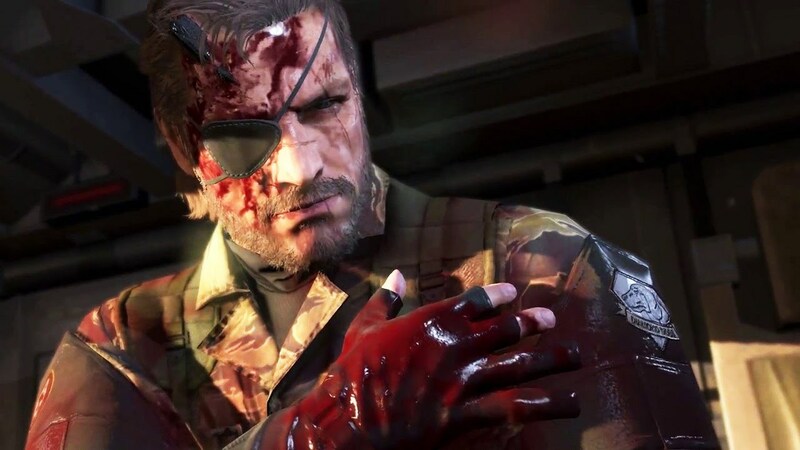 Metal Gear Solid V: The Phantom Pain, developed and published by Konami, follows a mercenary named Big Boss, or more commonly referred to as Snake, whose base is destroyed by a shadowy organization known as Cypher and as a result he loses his arm and ends up with a hunk of shrapnel stuck in his head, spending 9 years in a coma. Now awake and armed with a new mechanical arm, Snake is out for revenge while building his own mercenary army. In a drastic change for a Hideo Kojima game, this story is mostly told through audio recordings rather than hour long cutscenes, which works to the games advantage. You’ll spend a lot of time travelling so it gives you something to listen to as you ride across the desert. It also removes a block that stopped a lot of people from enjoying the series, making it much more accessible than before. 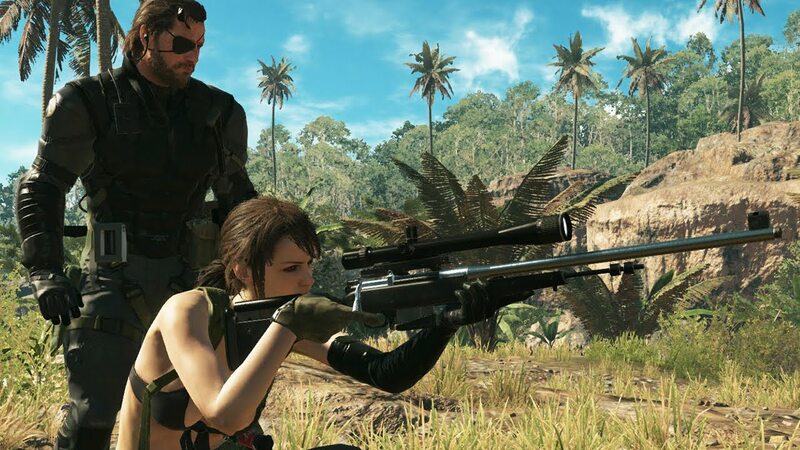 You don’t even need to have played the previous games to enjoy this, another first for an MGS game, but there’s enough to keep fans happy, from younger versions of characters to returning favorites. One aspect to the MGS games is the attention to both gameplay and story, with both receiving a lot of focus and attention to make it the best it can be. But they usually feel like different aspects, like you have the story and then the game itself. But in the Phantom Pain they feel more closely intertwined. In fact the “True Ending” helps fuse the two together, creating the most immersive story that I have experienced in a long time. The game is a free roaming game that allows for multiple ways to interact with missions. An assassination mission can be taken on with a full assault using tanks and machine guns, or you can snipe him from a hillside, or sneak in and stab him Assassins Creed style. You can even extract the guy for use in your own army, be it by calling in a helicopter pick up or with a Fulton Recovery Device, or in main missions you can drive them outside of the mission zone. You have multiple weapons, which you can request at any time that can be upgraded over time and even customized eventually if you go out of your way to find the Legendary Gunsmith. These weapons can be either lethal or non-lethal, and can be equipped with a suppressor that deteriorates over time as you fire, but can be taken off on the fly so you can save it for when you need it. Damage is location based, with the ability to shoot an enemy in the arms to disable them, or into their eyes to avoid hitting their helmet, or in the kneecaps to stun them, after which you can let them bleed out, finish them or extract them. You can also use more advanced tactics like hitting a target in the knee to make them fall and open them up to a headshot. 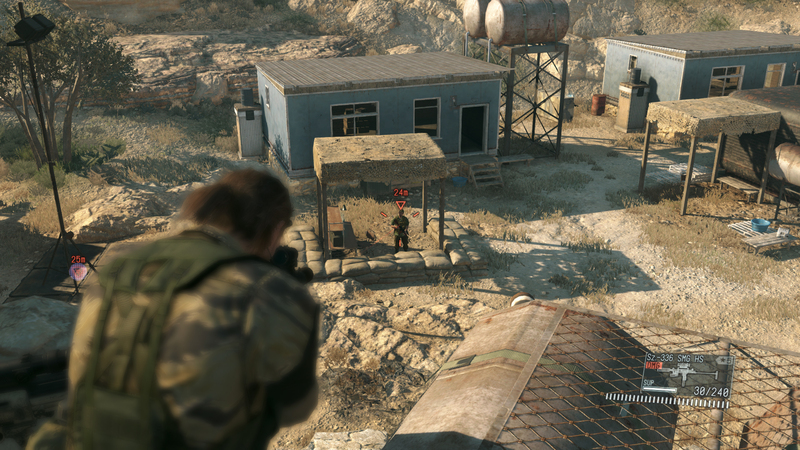 A huge improvement over previous games is CQC, where you take enemies on in close combat. You can throw a target, punch them, charge in and sock them with your robot arm, disarm them and hold them up with their own weapon or grab them in a choke hold, where you can use them as a shield, choke them out, slit their throat or throw them away. After holding them up or grabbing them you can also interrogate them, for mission intel or soldier positions. You can also order them to lie on the ground if you hold them up, which is a nice touch. When spotted by the enemy you automatically enter reflex mode, giving you a split second to react. Stealth is based on your camouflage and environment, as well as on the weather. Rain and sandstorms obstruct vision, making well timed runs to an objective essential to capitalize on these little gifts from nature. A good tactic is to view the enemy camp and mark targets during the day, and then wait until night to infiltrate, when you’re harder to spot. This is one of the few games where the time of day and weather actually matter. When you’re spotted from a distance it’s not an immediate alert, since they will peer for a closer look, shine a flash-light or come over to investigate. Sometimes they will completely over look you if you hit the ground fast enough or lie down flat. Then of course there’s the always-popular cardboard box. This can be used in multiple ways, from popping out and shooting, diving out for a quick escape, sliding out of the box quietly, turning the box into a makeshift toboggan and can be outfitted with posters like an enemy soldier to fool the enemy from a distance, or a distracting underwear model. My personal favourite being to distract them with an adorable anime girl then slide out of the box without them noticing. Vehicles can be taken from the enemy or called in if you have them to spare, or keep them for use by your soldiers in missions, though you primary transport will typically be one of your buddies. The first buddy is a horse, which comes when you call and can be hidden behind on missions, making him the most stealthy way to get around. The Second is a dog which you extract on one of your earlier missions and raise from a pup. He can bark to distract enemies, run in to attack targets and helps mark enemies nearby, making him invaluable for stealth missions. You can also develop new weapons for him like a knife and the ability to shock targets. Next is Quiet, a sniper who you first meet in battle, after which you can choose to kill her or not. But you really shouldn’t, because this badass is one of the most helpful partners in any game ever! She takes out enemies who spot you and also takes out targets you specify. You can even have her take aim and fire on your command, so you can sync up targets with her, to take out multiple enemies at once or to shoot off a helmet to give her a clear headshot. I know that everyone has commented on her outfit being fan service, which it is, but no one has talked about her as a character, ironically acting sexist by basing an opinion on a female character solely on her appearance and one creepy cutscene taken out of context, which is a moving and emotional story of someone giving her voice for the sake of another. Be it love or loyalty, it’s left ambiguous although I think it’s a little of both. The Last Buddy is a Metal Gear, a smaller model capable of zooming around on wheels and able to both pick up and punch targets. You can also upgrade your personal Johnny 5 with new weapons like a Gatling gun and a sensor to mark targets. I mention all of these aspects to give you an idea of how varied this game is! There are so many routes to take and variations within those routes. Stealth will always be the best option, but you’re not restricted like in previous games. You can play it however you want. It means that you are free to choose the methods and tools tuned to your play style, rather than doing what the game wants you to do. A huge aspect to gameplay is the idea of running your missions like a business. Using the helicopter to get too and from the field uses resources, as does calling in equipment and support. Everything uses resources and money, which you acquire in the field, or it can be generated over time by your support team. It really does put you in a survivalist position, wondering if it’s worth calling in a certain weapon or airstrike, or exploring the area for a replacement weapon. It encourages you to raid enemy outposts and search for new suppressors. You can extract enemies from the field to recruit them or as you go on you gain renown and attract more, better recruits. Developing new weapons will take the most of your income, though you need to level up your team to develop new gear, so you’ll be looking out for that one intel guy you need to silence your favourite rifle. This encourages you to explore to level up your gear and deal with more capable threats as the game progresses and your enemies become stronger. It also encourages stealth, since dead enemies can’t be recruited so you need to sneak up on enemies to knock them out. This gives you an actual reason to sneak, rather than going in guns blazing. 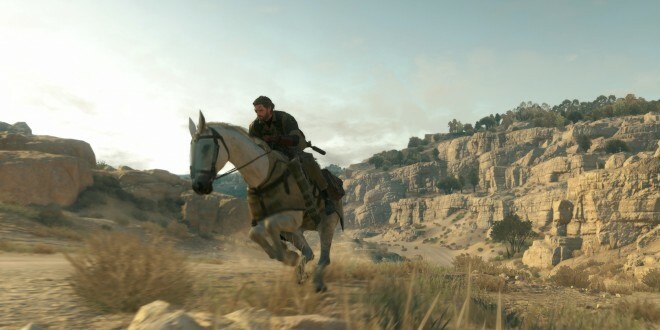 Metal Gear Solid V: The Phantom Pain is freaking masterpiece! The gameplay is rich and varied which never felt like a grind or became boring. You can even change up your equipment or strategy if it feels like you’re in a rut; in fact getting all the emblems involves playing levels with different weapons, which can usually earn you an S rank so long as you’re accurate and avoid taking damage. The story is both dark and complex, but broken down into manageable bites and told through tape recordings, so it’s only there if you want it. I adore this game! Even to the extent that I deleted my file after completing it so I could play it all again. I’m even struggling with the idea of buying it on the Xbox One too, so I can keep playing it! This entry was posted in Uncategorized and tagged Hideo Kojima, Konami, Metal Gear Solid V: The Phantom Pain. Bookmark the permalink.